NAPLES–G-NG standout John Martin both kicked off the action and led the scoring when he and his boys dropped in on the Lakers on Tuesday night, Jan. 15. 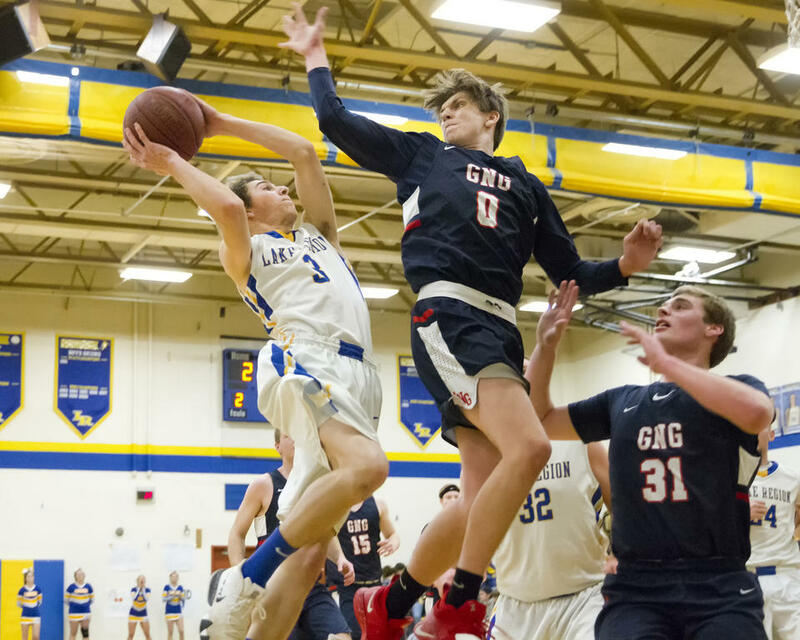 G-NG opened hot and never looked back as they cruised handily to victory over Lake Region, 75-42. G-NG also bested the Lakers when the two sides faced off to begin the winter – but that outing proved much narrower than this one. Eight different Patriots took the court over the course of the game, and all eight added points: In addition to Martin’s 23 (which included three threes), Wyatt Edwards had 12 (on four threes! ), Zack Pomerleau had nine, Hunter Colby eight (two threes), Johnson seven (two more threes), Ryan Lachance and Nick Kariotis six apiece and Josh Michaud four. The Lakers also got points from every boy who stepped onto the floor – they just didn’t get nearly enough points. Isaac Holland led the team with eight; Liam Grass added seven; Evan Willey six; Matt Mayo and Mark Mayo four each; Derek Langadas, Noah Neal and Jake Arey three each; and Dawson Smith and Anthony Thomas two apiece. Martin opened with a three just 20 seconds into the first, then followed himself up with another three 20 seconds later. Colby hit the team’s next three, 9-0, before Holland put Lake Region on the board with a two. Pomerleau then hit a pair of free-throws and Matt Johnson one as well; finally, Johnson nailed a three and then another three for 18-2. Holland converted on a steal and Thomas drained a free to inch LRHS forward, but G-NG closed the quarter in style: Martin took a waning-moments shot, but it wouldn’t fall, so Kariotis trailed after him with an offensive rebound and a rim-rolling, buzzer-beating two. The Patriots extended their lead in the second on contributions by Pomerleau, Martin, Lachance and Edwards. For their part, Lake Region turned in a much better tally through those eight minutes, with Grass, Willey, Holland and Mark Mayo combining for 14, but the team still lagged by a mile at the break: 40-19. Deschenes applauded the Lakers’ determination, despite his boys riding roughshod over them: “They do not give up,” he said. “We got a good early lead and they scrapped. They played physical they forced us to turn it over a little bit in the half-court. We had a string of turnovers in the second quarter that enabled them to get a little bit of life…They’re certainly relentless for 32 minutes. Edwards owned the third quarter for the Patriots, notching three threes; meanwhile, seven different Lakers added points in the stretch, but the team’s total takeaway still trailed G-NG’s. 59-34 after three. The Patriots then pushed even further ahead in the downhill eight minutes, and the ending buzzer tolled on a 75-42 result. Part of the reason for the Patriots’ dominance on Tuesday was no doubt their experience; the Lakers aren’t necessarily young, but nor do they have much varsity playing time under their belts. But another aspect of G-NG’s strong play is simply their dynamism and their willingness to try new things. Colby and Lachance – the outfits two inside bigs – haven’t typically taken the court together, for instance, but as it turns out, they have great chemistry. G-NG – ranked second in B South at the moment – moves to 8-3 on the season. The Patriots welcome Wells (seventh, 6-3) on Saturday the 19th. Lake Region, meanwhile, slips to 2-9. The Lakers currently sit in 11th place; the team hosts Poland (12th, 3-8) on Friday the 18th. Laker Ryan Walker makes for the net; Patriot Zack Pomerleau defends. G-NG’s Ryan Lachance squeezes between a pair of LRHS opponents. Connor Myatt pulls the trigger. Patriot Matt Johnson fires off a low-angle ball. John Martin hashed 23 to helm the Patriots’ victory. Wyatt Edwards had a big evening for the Patriots beyond the arc. Isaac Holland rolls a shot toward the rim. Evan Willey unwinds into a Lake Region shot. Mark Mayo tries for two, getting air over a G-NG opponent. Anthony Thomas drives for the Lakers. Wyatt Kenney aims an inside jumper at the net.